Carbon Tax and Shift: How to make it work for Oregon's Economy. Energy Foundation and Portland State University’s Institute for Sustainable Solutions (ISS). This study analyzes a carbon tax and tax shift in Oregon as a means of reducing market inefficiencies by placing a meaningful price on carbon emissions. This study shows that a carbon tax can reduce distortionary income taxes, and provide new revenue opportunities for Oregon. By taxing carbon emissions and reducing Corporate and Personal Income tax rates, Oregon can reduce the negative incentives created by income taxes while generating revenue and reducing carbon emissions. The report shows that putting a price on carbon in Oregon can result in reductions in harmful emissions and have positive impacts on the economy. Liu, Jenny H. and Renfro, Jeff. 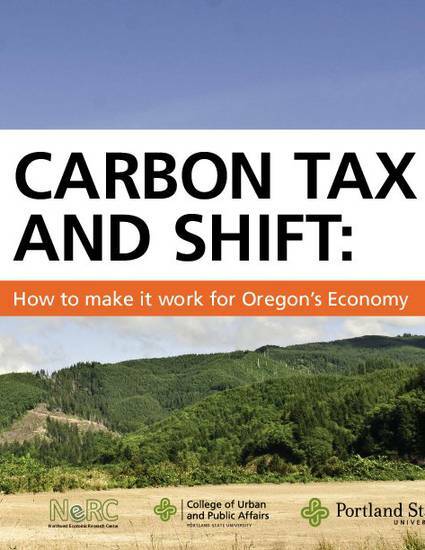 (2013) Carbon Tax and Shift: How to make it work for Oregon’s Economy. Northwest Economic Research Center Report.